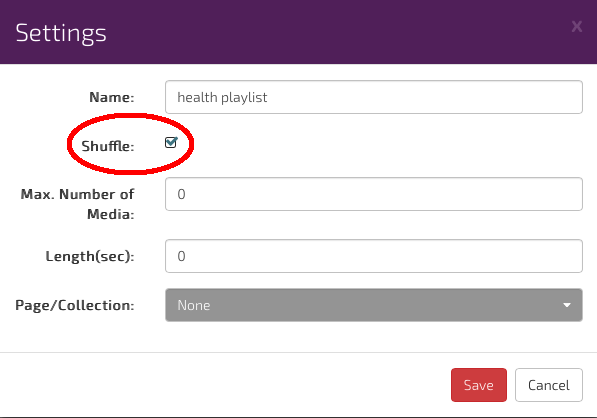 Creating a Playlist allows you to play your media in a predefined order. ie Play file 1, then file 2 , file 3 etc. However you may wish to randomise the playback, so files will play in a random order and not sequential. You can do this with the Shuffle option. 2. Locate the Channel containing the Playlist that you wish to Shuffle. If you do not have your Playlist already assigned to your Channel you will not be able to shuffle it. 5. To set a Shuffle on your Playlist media , tick the box next to Shuffle. 7. Once complete make sure that you press the button.